NSHOST Review 2019: Is NSHOST a Good Hosting? I signed up to NSHOST, reviewed their unique features, tested how easy they are to use, checked with support on several issues, and tested the speed of the live site. When done, I tried to cancel my account and receive a refund. This is my experience with NSHOST - I hope you can learn from it. 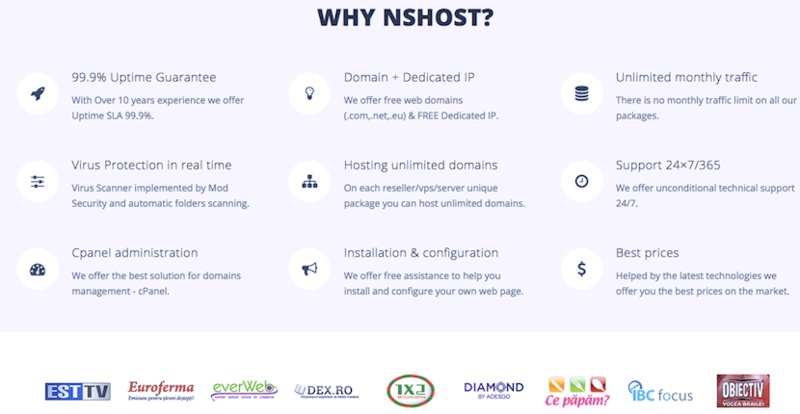 Romanian web hosting provider NSHOST was founded in 2007. They currently have over 2500 clients and primarily serve a local customer base. Their website is available in both English and Romanian, and their prices are listed in United States Dollars, Romanian Leu and Euros. NSHOST’s shared hosting plans are very comprehensive. They offer the Softaculous one-click installer with an above-average 320+ scripts, cPanel, and daily backups retained for 30 days, along with unlimited subdomains, mailboxes, and FTP accounts. Code-savvy users can make use of NSHOST’s support for PHP versions 4-7, cron jobs, and remote MySQL access. As standard, all plans come with a variety of security measures including security/antivirus protocols, DDoS attack protection, FTP virus scanning, and firewalls. Unfortunately, they don’t offer support for more advanced coding languages or a website builder, though they’re one of the few providers I’ve seen that actually offers a dedicated IP address with all but their most basic shared hosting plan. Their infrastructure is solid as well. Their servers are located in a Romanian data center and they offer RAID 10 SSDs for disk reading speeds up to ten times faster than traditional HDDs. They use the latest LiteSpeed Web Server and FastCGI technology, which means your website will run up to ten times faster than a standard Apache Web Server. They also offer a 99.9% uptime guarantee, although they don’t seem to offer any compensation in the event that this level of uptime isn’t met. NSHOST offers four shared hosting plans: Alpha, Beta, Gamma, and Special. Given the number of value-added features included, they’re one of the more inexpensively-priced providers I’ve seen. SSL certificates, website migration services, and one .ro or .eu domain are free with all plans. Payment channels include cash deposits, bank transfer, treasury institutions, PayPal, or credit card. While they don’t appear to have a money back guarantee, you can try their hosting for five days with no payment required. Note that once you exit their main website and enter the checkout flow, their webpages are only available in Romanian. To get support, you can contact them by phone Monday to Friday between 10:00-22:00 GMT+2 or by email 24/7 for technical support. Existing customers can log in to get access to a support ticket system and FAQ section. I’d rate NSHOST’s quality of support above average: they’re quick to respond by email and very well-informed. Since their launch in 2007, NSHOST has grown to become one of the better web hosting providers in Romania. They’re still small in size, but this seems to have resulted in better rather than more diluted standards of service. Check out NSHOST’s web hosting options today! Wondering how NSHOST stacks up against other Web Hosting companies? Enter any other Web Hosting company and we will give you a side-by-side comparison.